After losing the first set, Serena Williams came back to defeat Bethanie Mattek-Sands on Friday at the 2015 U.S. Open. Serena Williams is three matches from winning her fifth consecutive Grand Slam tournament after advancing to the U.S. Open quarterfinals Sunday. She has amassed her 32-match winning streak at Slams the hard way: 10 times she has had to play a third and deciding set, eight times after dropping the first set. Carl Bialik is hosting a short podcast throughout the tournament. New episodes can be found in the ESPN Podcenter as well as in iTunes. In the latest episode, he discusses Serena Williams’s comebacks with Louisa Thomas of Grantland. The shorter format hasn’t yet stopped Serena Williams’s quest to win all four Grand Slam events this year. But it may be hurting women’s tennis overall by leaving later Grand Slam tournament rounds with fewer top players compared with the men’s side. At the U.S. Open, for example, only three of the top 10 women’s seeds reached the third round, while nine of the top 10 men’s seeds did.2 This often means exciting upsets for women’s tennis fans but also more matches without marquee names. Best-of-five made a comeback in the women’s game in 1984, in the final of the annual tour championships. The five-set final in 1990 “was so intriguing and so enthralling that the 17,290 fans at Madison Square Garden were roaring for more,” the Philadelphia Inquirer reported. After another five-setter in 1995,11 runner-up Anke Huber said “everybody among the women can do it” and called for the format to be introduced in Grand Slam finals. If women and men both started playing best of five sets at majors, schedules during the early rounds would get crowded. To prevent this, Kovalchik told me in an email that she suggests having men and women play best of three in the first two rounds and then best of five in the last five rounds. That wouldn’t reduce the number of early upsets on the women’s side, but would mean the men’s side would likely have more upsets than it does now — perhaps as many as the women’s side.12 And playing shorter matches might help reduce the number of midmatch withdrawals13 by players, which are higher on the men’s side during Slams than during other events. CORRECTION (Sept. 7, 2:24 p.m.): An earlier version of this article gave an incorrect title for Bill Babcock in a footnote. He is the director of the Grand Slam Board, not the chairman of the Grand Slam Committee. CORRECTION (Sept. 7, 8:34 p.m.): An earlier version of this article incorrectly described the deficit that male tennis players have come back from at Grand Slam events this year (through the first three rounds of the U.S. Open). They have come back to win 59 times after being down two sets to one, not from a two-set deficit. Nadal lost after leading by two sets to none at the U.S. Open on Friday, but usually, the men’s format favors the favorites. One of the top 10 women’s seeds, Maria Sharapova, withdrew before the tournament; six others lost before the third round. Kovalchik presented the paper at the Joint Statistical Meetings in Seattle last month. It is scheduled to be published in the magazine Significance next month, according to Kovalchik. Kovalchik’s term for Premier Mandatory and Premier 5 tournaments. The Women’s Tennis Association, which oversees non-Slam women’s events. The ATP World Tour, which oversees non-Slam men’s events. In the 486 completed women’s Grand Slam matches this year through the third round of the U.S. Open, first-set losers have come back to win 18.5 percent of the time. In 470 completed men’s matches, first-set losers have come back to win 21.5 percent of the time. 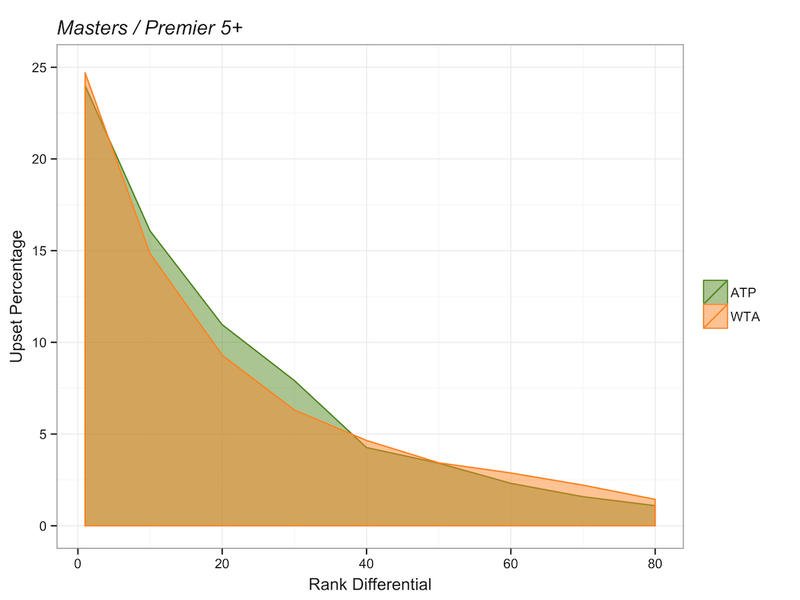 If each player had an equal chance in every set, the player who loses the first set would have a 25 percent chance of coming back in a best-of-three-set match (because she’d have to win the next two sets) but a 31.25 percent chance of coming back in a best-of-five-set match (five out of the 16 possible combinations of wins and losses in the next four sets yield a win). The actual comeback percentages are lower because the better player usually wins the first set and has a better than coin flip’s chance of winning each subsequent set. 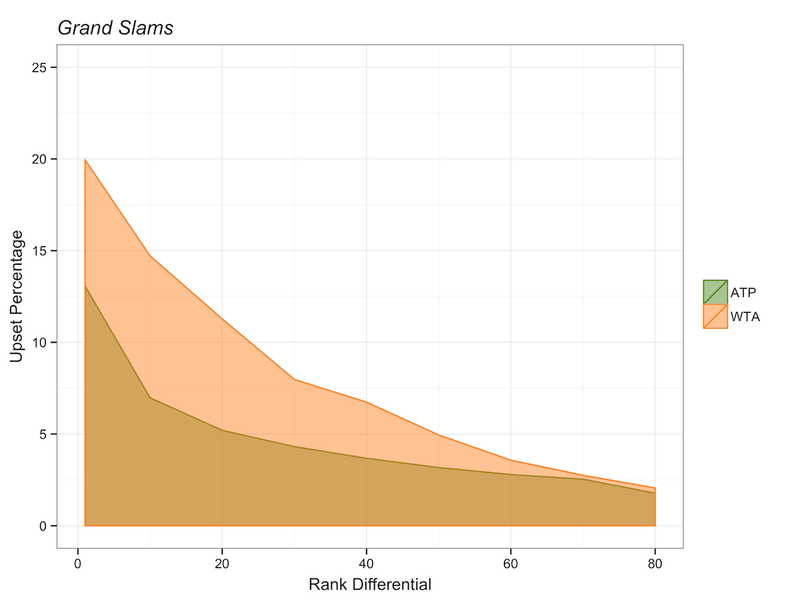 Playing the shorter format also means women’s matches take less time, which diminishes their share of prime-court and TV exposure at the Slams. Bill Babcock, director of the Grand Slam Board, which sets the rules for the Slams, declined to comment. The WTA’s communications staff didn’t respond to a request for comment. A forerunner of the U.S. Open. A match that left fans “gasping for breath more often than either of the women, who had been swinging from their heels,” according to the Philadelphia Inquirer. Men played best of three in early rounds at the Australian Open and French Open in the 1970s. Called, confusingly, “retirements” in tennis.